Diverse, innovative, experienced… SunnyGem Grows Quality! Our goal is to supply the highest quality almonds, at competitive prices, to customers worldwide. Our quality commitment does not stop there. From our farming company, growing partners, and all of our employees we pay attention to every detail of our almonds, from the orchards to the finished product. We have an exceptional and experienced customer service and quality control team that supports our efforts and assist our customers with any questions they may have about our products. We listen to our customers, understand their needs and are never satisfied until they are. We are one of the largest vertically integrated almond suppliers in the world. As the processing and sales branch of the organization, SunnyGem almonds are sorted, processed and sold to the wholesale ingredient industry. Our farming company, Sandridge Partners, farms thousands of acres of almonds each year in the central region of California providing an ever-increasing supply of almonds. 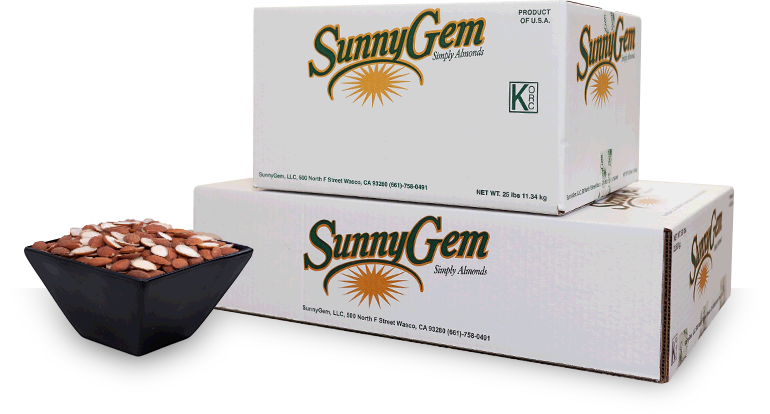 SunnyGem is the one-stop-shop for your almond needs, packing and shipping California varieties worldwide. In addition to inshell and raw natural almonds, a state of the art processing facility provides manufacturing and roasting to your specifications. Validated processes that pasteurize the almonds are performed in-house. Package options range from 25lb cartons to 2,200lb super sacks.